Looking into our local studies archives I have discovered that the Solstice festivities have not always been peaceful as the Druids would wish. In 1901, Salisbury Police invoiced the landowner of Stonehenge, Colonel Sir Edmund Antrobus ‘for police services rendered’ for the night of 20th June. He was charged for one Superintendent, one Inspector, two Sergeants and seven Constables a total of £3. 4s.2d. presumably this would have been for crowd control or public order duties. During the 1950s the Druid procession was accompanied by the Military Police and members of the Army. The security operation was overseen by the Ministry of Works (a government department responsible for building projects). 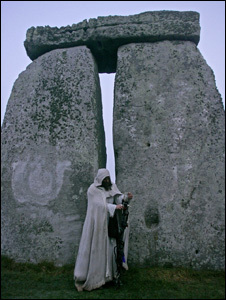 Public gatherings at Stonehenge increased not only by the number of people but also in disorder. There were reported to be many barrels and crates on site, presumably of beer. The ‘high jinks’ was quashed in 1956 when young officers threw ‘thunderflashes’ in to the unruly crowd. By the early 1970s a small music festival was conceived, which took place in woods near Amesbury during the days leading up to the 21st June. This was the beginning of the Free Festival which continued to grow in popularity and controversy throughout the ‘70s until 1984 when it ended abruptly. During the early 80s a new wave of ‘new age travellers’ replaced the ‘hippy’ label of the ‘60s. Large numbers of travellers would congregate on private land and were reported to have committed trespass, criminal damage and public order offences. On June 1st 1985, events came to a head culminating in the infamous ‘Battle of the Beanfield’. It wasn’t until June 2000 that a truce was finally made between the authorities and members of the public; 5000 people were given the privilege of entering the sacred circle. On Thursday 5th September, one of our archaeologists, Rachel Foster, will be giving a talk on ‘Stonehenge & Avebury World Heritage Sites’ at the History Centre, contact the centre for further details. Alternatively, records are available to view by members of the public. We have copies of newspapers on microfilm, newspaper articles in our ephemera collection and also scrapbooks on ‘The Battle of Stonehenge’. We also hold the book ‘The Battle of the Beanfield’, edited by Andy Worthington, published by Enabler Publications in 2005 and utilised for this article.